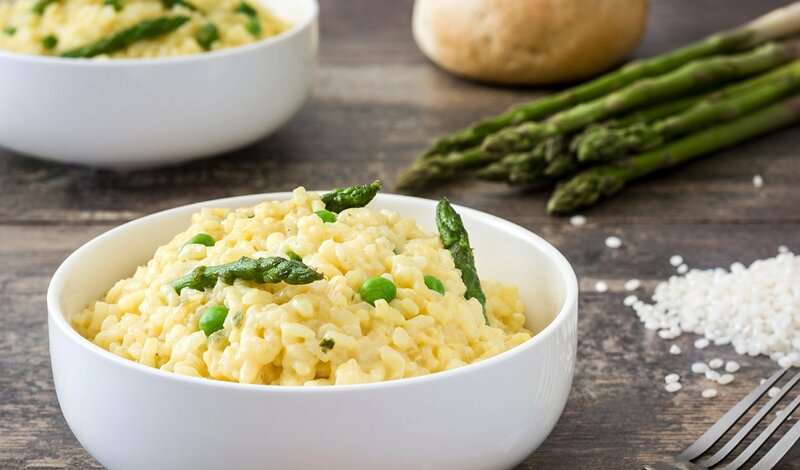 The distinct flavor and texture of asparagus create a delicious complementary ingredient to this spring risotto. Blanch asparagus tips in boiling salted water, about one minute. Place in ice bath; chill and reserve. Sweat onion and garlic in the olive oil. Add rice and stir. Lightly toast rice, then deglaze with wine. Add about 1 cup preparedKnorr® Liquid Concentrated Base Chicken and stir, as the broth evaporates, continue to add in1 cup portions while stirring. Cook risotto until rice is al dente and most of the liquid is absorbed. The texture should be creamy. Stir in asparagus tips, peas, cream and Parmesan cheese; adjust seasoning. Note: For wild mushroom risotto, add ½ cup of sautéed wild mushrooms.